Her most basic tenet is to evaluate your possessions based on whether you feel they spark joy. If it isn’t functional or spark joy, it’s out! After simplifying in this way, it becomes easier to functionally organize your possessions. Of course, simplifying and ridding your house of clutter is always a good recipe for success when showing your home as a potential seller. Showing a buyer how functional and easy your house is to live in is key! That doesn’t mean you need to rid your home of all personal and nostalgic items, especially if you are still living in the home… just don’t expect a buyer to look past your clutter. Thank streamlined and comfortable! As real estate professionals, we can help you present your home in the best possible light and help buyers see the potential in your space. Please contact us using the contact tab above if you would like us to take a look and give you some tips! I wanted to close by adding this video tutorial that shows you how to fold any item for aesthetic and functional storage. 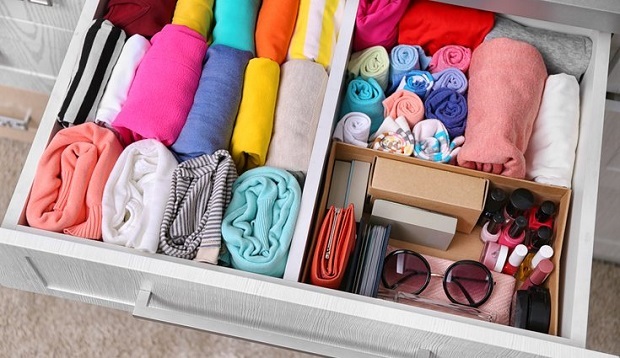 Kondo recommends that you fold items so they can stand vertically in a drawer both to save space and making every item visible. Do my folds look like this? Well, no. But maybe yours can! Edit: One of our clients sent us this KonMari parody video in response to this post so we decided to share it – enjoy!